John Doherty has catered for 1000s at a time, so a local restaurant is heaven for him. “The State Department told me, ‘It’s never happened before and will never happen again.’” Chef John Doherty tells me in his Flatiron apartment on a Friday afternoon over espresso. That ‘it’ refers to the time he prepared a meal for the six world leaders in 1985, as Executive Chef at the Waldorf Astoria. 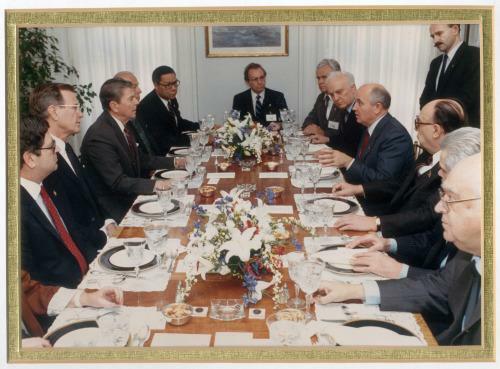 Doherty made dinner for the 40th anniversary of the United Nations for Ronald Reagan, Margret Thatcher, Helmut Kohl, Martin Brian Mulroney, Bettino Craxi and Yasuhiro Nakasone. Up on the 17th floor in Flatiron, Chef John Doherty wakes up to the Manhattan skyline before heading to his new restaurant, Black Barn, right on Madison Square Park. The two bedroom, two bathroom home features a chef’s kitchen, spacious living room with floor to ceiling glass windows and an outdoor patio. The home has a modern feel with rustic touches complete with French inspired furniture and hues of rose, dark wood and gold. A combination of traditional and new age pieces complete the home accentuating the tall ceilings, cream colored walls and dark wooden kitchen cabinets and paneling. Born and raised on Long Island, Doherty began working at the Waldorf at 19. He worked there for over thirty years, before opening his first restaurant, Black Barn. He shares the home with his wife and two dogs, Esther and Chloe. The chef’s last meal would be anything he can eat with a spoon, and that could be a plethora of fine eats. He’s cooked for every president from Bill Clinton to George Bush Sr., who happens to be his favorite. Doherty invited the Observer in to chat about all things food to politics. How did you get your start? I started washing dishes at fourteen, which turned into a cook’s job. I soon fell in love with pleasing others with my craft. What was it like working at the Waldorf for so long? Working at the Waldorf is not for everyone. Most people at the management level put in a year or two and moved on. The Waldorf is counterintuitive to that formula right from the beginning. It has 42 floors of rooms and suites (1467 in total) of which no two are identical. There are three restaurants with full kitchens, a 24 hour room service kitchen, the main kitchen that takes up a full city block consisting of a 24 hour pastry shop, a butcher shop, soup kitchen, sauce station, Garde Manger, a salad/vegetable room. What were the kitchens like? There are three banquet kitchens, all of which serve anywhere from 5-7,000 meals a day. During my tenure, I had 7 Chefs, 13 Sous Chefs and 130 cooks. Imaging trying to inspire 150 people to cook with passion while managing all the moving parts in a unionized environment under a corporate culture that was extremely bottom-line driven. Now that you get the daunting picture, most managers chose to move on but I loved the challenge. It took me several years to develop a team that was truly inspired and produced the kind of food that at one time set that Waldorf apart from the rest. It was an amazing learning experience that has prepared me to be successful as a restaurateur. What was the best part of working at such an iconic hotel? Successfully moving a business forward in such a difficult environment was extremely rewarding. Cooking for and meeting world leaders was thrilling because you would realize that at that moment in time, you were part in some way of history in the making. And now you’ve ventured out on your own with Black Barn, my new favorite restaurant. How’s it been? I am so grateful to have Black Barn as it is my dream come true after such a long journey. Having a dream, a plan, having perseverance and finally bringing that dream to life is extremely satisfying. Black Barn consists of a million details that combined; provide a guest experience that will sustain the business for years to come. How did you land on the location for your new restaurant, Black Barn? I’ve been looking for a restaurant for more than 15 years. Many deals fell through, some I couldn’t raise the capital, most, I didn’t like the location or I couldn’t make the financial model work. When I was shown this space (19 east 26th street) I knew it was my deal. The area can support a large restaurant because there is significant business, residential and retail. What are some of your favorite art pieces? There is an engineer’s drawing of the Varazano Bridge, which has all of the dimensions on it. My father was an electrician who climbed the suspension polls to install the lights so it connects me with my dad when I look at it. I have many photographs with presidents and leaders. Although, I get pleasure from visual art, it is consumable art that I get more pleasure from. By that I am referring to wine, Bourbon, Cognac, Scotch and of course food. What makes someone a New Yorker? Definitely resilience and perseverance. It’s a competitive and high-energy place. Everybody seems to learn a little something about themselves when they move to New York. You learn how to stand up for yourself, or you get lost. Other than the food, what’s the best part of living in NYC? I love the convenience of being able to walk within a block or have delivered anything you need. I have always found the energy of the city intoxicating. I also love the parks to decompress in.